One player who appears to be on the rise is small school offensive lineman Terron Armstead of Arkansas Pine Bluff. Unfortunately, his stock is really starting to rise and he may get drafted before I expect the Titans to look at the tackle position (although I have seen him listed at OG). Also, its not out of the question that hte Titans might actually look at tackle this year and early on, given the age of their current tackles and the lack of good options behind them. 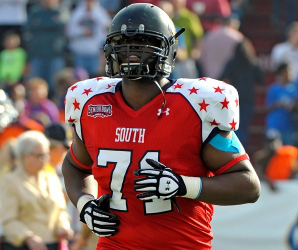 Armstead really shined at the Combine and wasn’t too shabby at the Shrine Game either. At 6′ 5′ and 306 his frame reminds me a bit of Mike Roos who plays tackle for the Titans.